Toyota has unveiled a hydrogen cell electric truck that can cover 300 miles on a single tank of fuel. 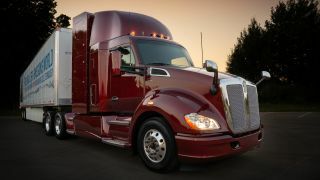 The truck, known as Codename Beta, is the second vehicle in Toyota's Project Portal experiment, and will soon be hard at work hauling cargo at the ports of Long Beach and Los Angeles, California. Project Portal is fast moving in every sense. Beta's predecessor, Alpha, went from an initial concept to a real vehicle on the road in just a year, and has already logged over 10,000 miles in testing at the ports. Alpha is capable of carrying 36.3 tons, and can travel over 200 miles on a full tank – an important consideration considering the shortage of fuel stations for hydrogen-powered vehicles. Each of its individual journeys is quite short – a type of haulage work known as drayage. There are currently more than 43,000 drayage trucks at ports across the US, releasing a significant quantity of particulates, carcinogens and other substances the air. Project Portal trucks, however, emit nothing but water vapor. “By evaluating the first truck in our test facilities and on the actual roads in the LA area, we made a list of improvements for the Beta truck build process and performance enhancements,” said the project's chief engineer Andrew Lund. Toyota is aiming to eliminate all CO2 emissions at its Port of Long Beach logistics facility, and is investing heavily in sustainable vehicles elsewhere. In addition to its work on land, the company is sponsoring the world's first hydrogen-powered ship, Energy Observer, on a six-year world tour. Energy Observer solves the issue of intermittent fuelling by generating its own hydrogen from seawater. The water is demineralized (removing salt and ions) and separated into hydrogen and oxygen through electrolysis. The hydrogen is stored in pressurized tanks until needed. "This project once again demonstrates the many practical uses of hydrogen that can be developed as we transition towards a hydrogen society,” said Matt Harrison, vice president of sales and marketing at Toyota.